Mother Church earnestly desires that all the faithful should be led to that fully conscious, and active participation in liturgical celebrations which is demanded by the very nature of the liturgy. Such participation by the Christian people as "a chosen race, a royal priesthood, a holy nation, a redeemed people" (1 Pet. 2:9; cf. 2:4-5), is their right and duty by reason of their baptism. 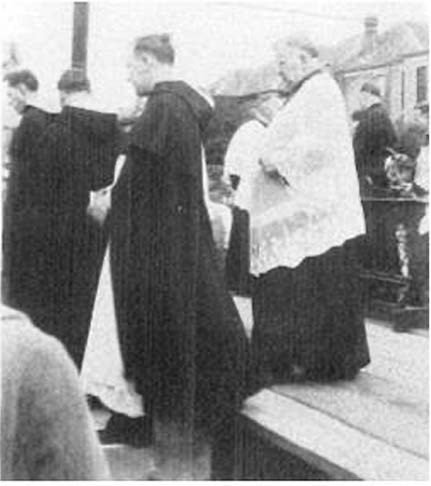 In the restoration and promotion of the sacred liturgy, this full and active participation by all the people is the aim to be considered before all else; for it is the primary and indispensable source from which the faithful are to derive the true Christian spirit; and therefore pastors of souls must zealously strive to achieve it, by means of the necessary instruction, in all their pastoral work. Popular devotions of the Christian people are to be highly commended, provided they accord with the laws and norms of the Church, above all when they are ordered by the Apostolic See. Devotions proper to individual Churches also have a special dignity if they are undertaken by mandate of the bishops according to customs or books lawfully approved. But these devotions should be so drawn up that they harmonize with the liturgical seasons, accord with the sacred liturgy, are in some fashion derived from it, and lead the people to it, since, in fact, the liturgy by its very nature far surpasses any of them. Praying for others, both the living and the dead, is one of our privileged rights and responsibilities as Catholic Christians. Intercessory prayer in the Dominican tradition guides many-if not most-of our prayers here at Holy Rosary. Our celebration of the Holy Mass, our daily recitation of the rosary, our lighting of the candles at the Altars' of Mary and St. Joseph are just a few ways that we pray for one another. We pray not only as a local community but also as a Dominican church family united with all our great Dominican saints represented in our beautiful stained glass. We gather again this Christmas as a Dominican church family believing in the power of intercessory prayer and in the meaning of the birth of Jesus Christ. We have certainly been through a whirlwind of a year! In just a few months, we have gone from enduring a devastating hurricane to celebrating with joy becoming a "Champions City"
Catholic Christians, but the gifts of grace that we receive only increase our capacity to love one another and truly be a Dominican church family. -br. James Martin Nobles, 0.P. But in order that the liturgy may be able to produce its full effects, it is necessary that the faithful come to it with proper dispositions, that their minds should be attuned to their voices, and that they should cooperate with divine grace lest they receive it in vain (2 Cor. 6:1). Pastors of souls must therefore realize that, when the liturgy is celebrated, something more is required than the mere observation of the laws governing valid and licit celebration; it is their duty also to ensure that the faithful take part fully aware of what they are doing, actively engaged in the rite, and enriched by its effects. The spiritual life, however, is not limjted solely to participation in the liturgy. The Christian is indeed called to pray with his brethren, but he must also enter into his chamber to pray to the Father, in secret (Matt. 6:6); yet more, according to the teaching of the Apostle, he should pray without ceasing (1 Thess. 5:17). We learn from the same Apostle that we must always bear about in our body the dying of Jesus, so that the life also of Jesus may be made manifest in our bodily frame (2 Cor. 4:10-11). This is why we ask the Lord in the sacrifice of the Mass that, "receiving the offering of the spiritual victim," he may fashion us for himself "as an eternal gift". I would like to propose that there are four cornerstones or elements of Dominican prayer: incarnational, sacramental, intercessional, biblical. For this week, I would Like for us to contemplate the first two. St. Athanasius' says, "For the Son of God became man so that we might become God." Because of Jesus' incarnation, there is no such thing as pure platonic evil, but a restored and transformed human nature made more perfect into the image and likeness of God. The closeness that we experience with God post-incarnation is far more than what we experienced pre-fall of Adam and Eve. Sure, we still mess things up when we choose to ignore God's will and prefer our own indulgences. However, we must not think that we are too dirty or too sinful to be transformed into the Imago Dei (image of God). Therefore, our prayer should reflect this transformation and intimacy that we have with the "Our Father." Also, when we are conceived in our mother's womb, the Imago Dei transformation has already begun for we are made in "the image and likeness of God"(Genesis 1:27). As Catholic Christians, we also have the privilege of having the Imago Dei sealed upon our soul at Baptism and confirmed by the Holy Spirit at Confirmation. The sacraments of the Church are not magic, rather they are a visible sign of an invisible reality (St. Augustine). They are both the visible and invisible sign that the Kingdom of God has already come but has not yet been .fulfilled. As a Dominican Church Family, both our belief in the incarnation and our participation in the sacramental life of Church animates our prayer life. For without these, what is the point of prayer, save only that we were truly made to "become God." -br. James Martin Nobles, O.P. The liturgy is the summit toward which the activity of the Church is directed; at the same time, it is the font from which all her power flows. For the aim and object of apostolic works is that all who are made sons and daughters of God by faith and baptism should come together to praise God in the midst of His Church, to take part in the sacrifice, and to eat the Lord's supper. The liturgy in its turn moves the faithful, filled with "the paschal sacraments," to be "one in holiness" (Postcommunion for both Masses of Easter Sunday); it prays that "they may hold fast in their lives to what they have grasped by their faith" (Collect of the Mass for Tuesday of Easter Week); the renewal in the Eucharist of the covenant between the Lord and people draws the faithful into the compelling love of Christ and sets them on fire. From the liturgy, therefore, and especially from the Eucharist, as from a font, grace is poured forth upon us; and the sanctification of all in Christ and the glorification of God, to which all other activities of the Church are directed as toward their end, is achieved in the most efficacious possible way. Dominican charism which makes you feel closer to God. The Dominican charism of prayer, study, community, and preaching makes all of us feel "at home at Holy Rosary Parish" - a phrase I have heard often during my time here. Therefore, I would like to invite you over the months of December and January to reflect with me on what makes our prayer, study, community, and preaching so unique, so Dominican. My hope is that we may share the fruits of our contemplation with one another and grow in our identity as a Dominican church family, a family which prays, studies, communes, and preaches for and with one another. 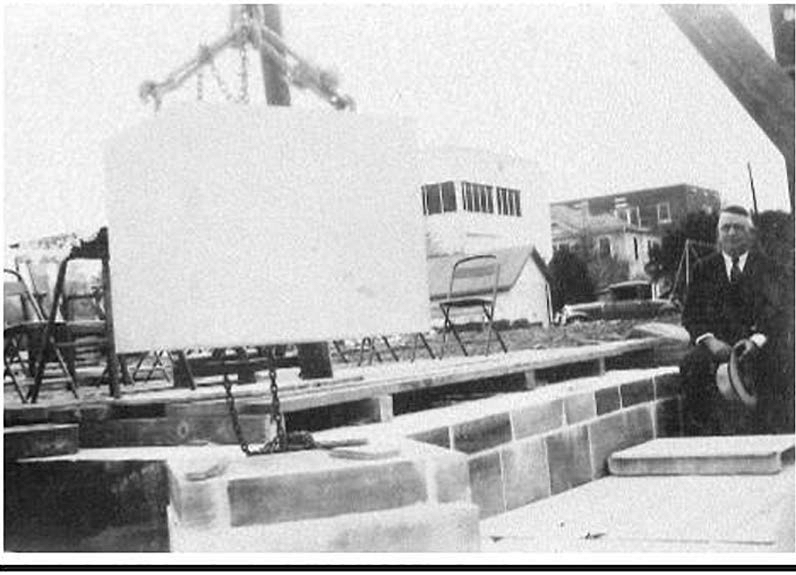 Photos are of Holy Rosary's 'Blessing of the Cornerstone' ceremony on Feb. 5, 1933. In the earthly Liturgy we take part in a foretaste of that heavenly Liturgy which is celebrated in the holy city of Jerusalem toward which we journey as pilgrims, where Christ is sitting at the right hand of God, a minister of the holies and of the true tabernacle (Apoc. 21:2; Col. 3:1; Heb. 8:2. ); we sing a hymn to the Lord's glory with all the warriors of the heavenly army; venerating the memory of the saints, we hope for some part and fellowship with them; we eagerly await the Saviour, Our Lord Jesus Christ, until He, our life, shall appear and we too will appear with Him in glory (Phil. 3:20; Col. 3:4). The sacred liturgy does not exhaust the entire activity of the Church. Before men can come to the liturgy they must be called to faith and to conversion: "How then are they to call upon him in whom they have not yet believed? But how are they to believe him whom they have not heard? And how are they to hear if no one preaches? And how are men to preach unless they be sent?" (Rom. 10:14-15). Therefore, the Church announces the good tidings of salvation to those who do not believe, so that all peoples may know the true God and Jesus Christ whom He has sent, and may be converted from their ways, doing penance (John 17:3; Luke 24:27; Acts 2:38). To believers also the Church must ever preach faith and penance, she must prepare them for the sacraments, teach them to observe all that Christ has commanded (Matt. 28:20), and invite them to all the works of charity, piety, and the apostolate. For all these works make it clear that Christ's faithful, though not of this world, are to be the light of the world and to glorify the Father before men. sacrifice of the Mass, not only in the person of His minister, "the same now offering, through the ministry of priests, who formerly offered himself on the cross" (Council of Trent, Session XXIl, Doctrine on the Holy Sacrifice of the Mass, c. 2), but especially under the Eucharistic species. By His power He is present in the sacraments, so that when a man baptizes it is really Christ Himself who baptizes (cf. St. Augustin.e, Tractatu.s in Ioannem, Vl, n. 7). He is present in His word, since it is He Himself who speaks when the holy scriptures are read in the Church. He is present, lastly, when the Church prays and sings, for He promised: "Where two or three are gathered together in my name, there am I in the midst of them" (Matt. 18:20). Christ indeed always associates the Church with Himself in this great work wherein God is perfectly glorified and people are sanctified. The Church is His beloved B1ide who caJls to her Lord, and through Him offers worship to the Eternal Father. Rightly, then, the liturgy is considered as an exercise of the priestly office of Jesus Christ. In the liturgy the sanctification of the people is signified by signs perceptible to the senses, and is effected in a way which corresponds with each of these signs; in the liturgy the whole public worship is performed by the Mystical Body of Jesus Christ, that is, by the Head and His members.